This is my first attempt at doing a Works for Me Wednesday! As much as I love that series, I had a sneaking suspicion that slobs like me shouldn’t participate. I imagined posting tips like “WFMW: Try feeding your kids — they love it!” or “WFMW: When you need to remember something really important, write it on your hand in permanent marker!”, putting Shannon in the awkward position of trying to find a nice way to ask me to please never share anything that works for me again. But I think I have something that’s actually helpful this time! Like a lot of moms of chaotic households, I plan out our dinners for each week so that I can stay on top of shopping and cooking. 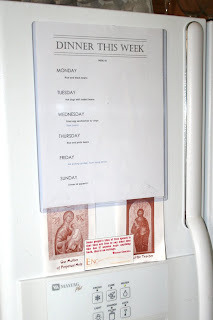 Back in 2005, I created a simple, clean little template menu in a Word document, and each Sunday I type in the week’s meals, print it out, and slip the paper into an acrylic display holder on our fridge (the holders are available cheap at any office supply store). My family loves to be able to anticipate what we’re having each night, it makes a good conversation piece when friends are over, and it’s handy for me to have the menu in a place where I can see it easily. Most importantly, it only adds about two minutes of work to type the meals into the template and print it — a big value add for such a little expenditure of time. NERDY TECH NOTES: To save the doc onto your computer, either click through the link and then hit the Save button, or right-click on the link and choose “Save Link As”. If the template looks weird on your computer it might be because you don’t have the same fonts I used, so you may need to tweak some of the formatting to get it to look right for you. You can see what it should look like in the picture. Also, I don’t list Saturday since that’s usually a leftovers/date night/pantry clean-out night for us. If you would like a template with all seven days, you can download that one here. I’ve been doing this every single week for more than three years, and it’s been surprising how much our little menu display has blessed our family. For more great tips check out Shannon’s Works for Me Wednesday at Rocks in My Dryer. That is a great tip. I have just restarted planning our weekly menu so I will have to try this. See, now, that wasn’t so painful, was it? such a good idea, and maybe it would help me actually do my low carb diet i keep telling myself i need to do! i’m planning next week’s meals today! I’d like the recipe for the crockpot chicken. I’m trying to do more crockpot stuff but lack ideas. Also, why is Saturday missing from the menu? I don’t list Saturday since that’s a leftovers/date night/freezer cleanout day for us. The recipe for the yummy crock pot cream cheese chicken is here. Here’s a tip for finding awesome crock pot recipes (or great recipes of any category): go to RecipeZaar.com and see the list of their most highly rated crock pot recipes. Anything that gets an average of 4.5 stars or higher is always excellent! Great job! Now start working on your tip for next week! UPDATE: I put up a template with all seven days here if anyone wants it! Here is a great site that we use. It does cost for a subscription, but fairly cheap, I download all of my menus as well as print 2 copies, one to keep in a book, and the one for the week. It gives us 7 meals plus the grocercy list broken down. We chose the weight watchers menu (many to choose from) and just by doing that I have lost weight because you don’t make more than you need, and the food is really good. It’s regular recipes adapted for the points system. We chose Wal-Mart as our store and we come pretty close to their total, within a few dollars. It’s a great way to budget your grocery bill. This is such a great idea. Believe it or not, I’ve done something similar for my one-person household – that way, I don’t have to remember what I meant to have for dinner on any given night. Love the memory aids – the “soak beans” on the night before. Another easy way to post it is to print off a blank calendar page from GoogleMail or YahooMail and scribble the planned dinners on that. You have an interesting blog. I found my way here via Robin at Blog Nosh. Delicious tip! That will be nice for when my kids learn to read so I don’t have to answer the “what’s for dinner” question 20 times a day. I just started doing this last a few weeks ago, and it’s amazing what a difference it has made! I HATE trying to come up with things to fix every day, so I just take a few hours on Saturday and come up with a plan. That way, I don’t have to think about it every weeknight – I “just do it”. Works for me, too! Your post brought me back to my childhood. My mother didn’t like to cook and with eight kids she came up with the same system you have, except her weekly menu rarely changed. Sunday = roast beef, Monday = Spaghetti, Tuesday = Baked Chicken Breasts (bone in), Wednesday = Hot Dogs, Thursday = Hamburgers, Friday = Fish (fish sticks, fish chowder, or tuna casserole (yech)), and Saturday = Leftovers. We didn’t have to ask what was for dinner since we had the menu memorized by the time we were three. If we had a spoon with our place setting we knew we were getting dessert. Since I am the cook in the family I can now appreciate her system, but it doesn’t stop me from kidding her about it. Jennifer, thank you and your husband for your witness to the faith. As a life-long Catholic your innocence and clarity have given me a new perspective on my personal relationship with Jesus. I am truly blessed to have found your blog. What a wonderful and quick idea! I have been doing this, too for a while and it is a huge help. You don’t have to waste any time during the day trying to decide what to have for dinner each day and then trying to see if you have all of the necessary ingredients. For those people who don’t want to have to do it on a computer, I post a blank calendar sheet for the month that I print out of Outlook and each week before I go grocery shopping, I write down the week’s dinners on the calendar and post it on the fridge. I’m snagging your template! Thanks so much for sharing something so helpful! Hey! You have the same fridge I do! Ditto – trying your template. I’ve have planned weekly menus off and on for years, but I’ve never been able to keep it up week after week. I love a list, so maybe this is what I’ve been looking for. Thanks! I like the idea, but my fridge is too covered with magnets, photos and…well, clutter to put that up. I have mine in a 3 ring binder that was supposed to turn into a home management system but so far the only thing in there is my meal planning chart, in one of those plastic sleeve things so I can write on it with a dry or wet erase marker and just use the same sheet over and over. I might just swap out my sheet for yours. I printed mine off another site and it has a ‘breakfast’ column. Seriously, am I going to go through and write ‘Cereal. Cereal. Cereal. Cereal.’ on every single day? The best tip I ever received was to list your meals in your online calendar as an event. Schedule them to repeat every 3-4 weeks.